Since being in the Dalmatia region we’ve seen lots of Hajduk symbols. They’re everywhere, under bridges, on the sides of buildings, on concrete retaining walls and even around the historic areas of Split. With images such as the masked fan, 1950 and Torcida on many of the murals we wondered what it was all about. 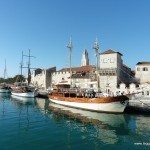 We met a girl at the HNK Hajduk stand on Split’s Riva to find out some more about Hajduk. She suggested that we take a tour of the Poljud Stadium. 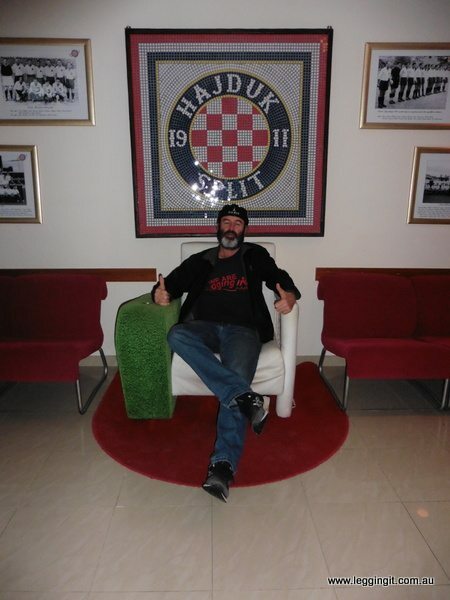 As we are both big sports fans we decided to book a tour of Poljud Stadium, Split the home of HNK Hajduk Split to find the answers to our questions. We met up with Frane outside the team store, along with some Croatian football fans from Vienna, Rijecka and a family of Croatian origin from Perth. Over the next two hours we were to learn a bit of what it means to be a Hajduk fan. Our tour started in the reception area where he club proudly lists its achievements on the wall before we moved into the lounge area. On the walls pictures of the founding fathers looked down on us as we all took turns getting photographed in the lounge chair designed like a football field. Frane told us how four Engineering students from Split, over a beer in Prague, decided that their hometown of Split needed a football team. The sport was popular in Split, and all of their friends were quite good players, so they decided it was time to found a professional club. On February 13, 1911 the club was officially registered. 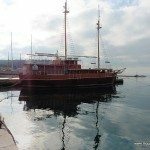 As legend goes they approached an old teacher, Josip Barač, for advice on naming the club and he suggested “Hajduk.” The Hayduks were bandits who fought against the Ottoman Turks. 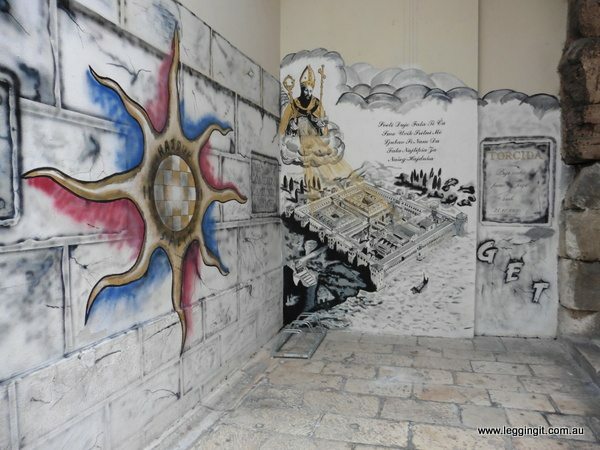 “Hajduk” means “freedom fighter or renegade”. “Hajduk” symbolises “that which is best in our people” Pretty inspiring stuff. Upstairs we went to the trophy rooms. In the passage a long cabinet was packed with all sorts of trophies won by the Hajduk junior development teams. The next room was filled with more cups and trophies won by Hajduk junior players.Wow what an array. In the final display room jerseys worn by famous Hajduk players lined the entry and trophies of all shapes and sizes filled the cabinets. 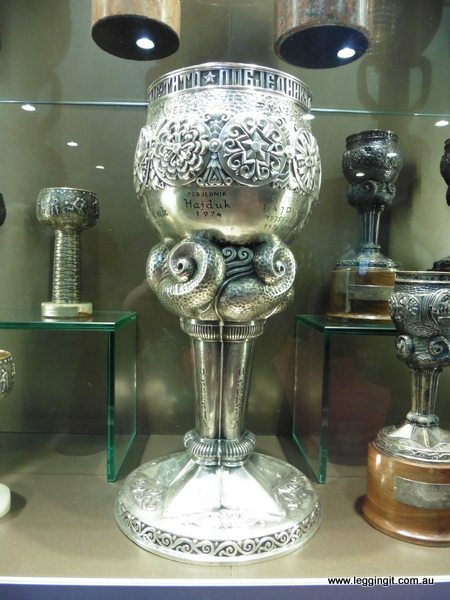 In the center cabinet stood the Yugoslav Cup, last won by Hajduk beating Red Star 1-0. It was made from 17 kgs of Silver. Frane told us how the club was worried that the cup would disappear after the break up of Yugoslavia so it was buried for 20 years in a barn . The Yugoslav cup seems pretty heavy but another massive cup on display takes four men to lift it. 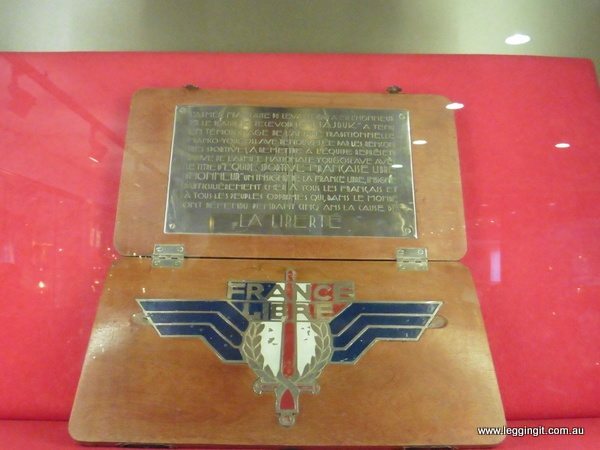 In a nearby cabinet proudly stands a legion of honour awarded to the club by French President Charles de Gaulle. 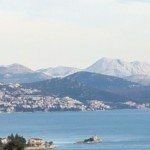 During WW2 the Hajduk players joined the Partisan general headquarters on the island of Vis and played as the official football team of the Yugoslav resistance. Frane told us how in 1944, the British Army beat Hajduk in a friendly match. 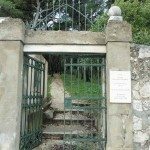 We also heard how Hajduk’s involvement in the Partisans earned them the reputation as “Tito’s favourite”. He even invited them to move to the Yugoslav capital of Belgrade and become the official Yugoslav Army team. Hajduk, however just wanted to play in their own home of Split. After the war Hajduk had a golden era visited Australia and became the first team from Yugoslavia who played on all continents. In 1950 they even won the Yugoslav championship without a single loss. 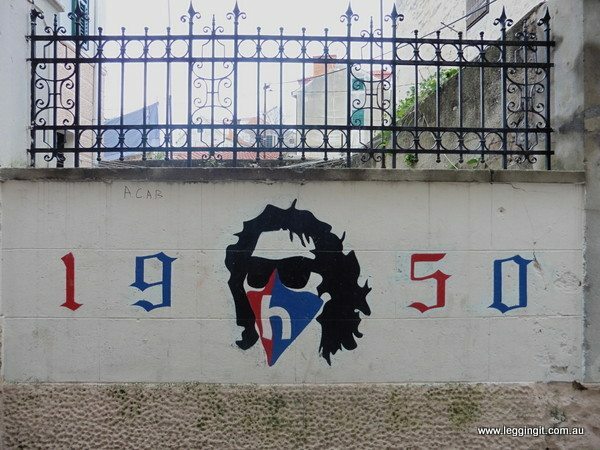 The day before the final where they defeated Red Star 2–1, the official fan organisation was founded, taking the name Torcida from Brazilian World Cup football fans. 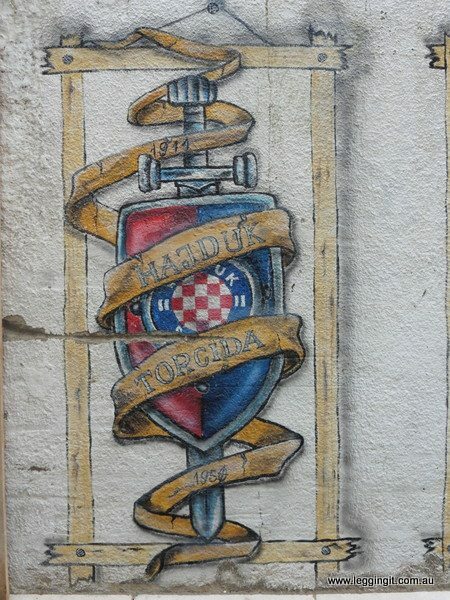 Torcida became the first organised supporters group in Europe. Hence, the 1950 written on signs reminds everyone of the great year for the club and supporters. Walking through the hallways of the stadium pictures of the famous footballers and newspaper articles adorn the walls. 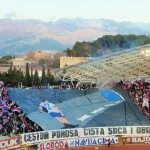 Frane was keen to tell us how Hajduk is proud of its success against the more fancied English and European rivals in the EUAFA. He also told how in their first official game against local team, Calcio, Hajduk won by 9-0. Supposedly the first goal was scored by Šime Raunig, with his knee. In the Press Room we stopped for another photo opportunity. It was nice to sit in the seats normally occupied by victorious coaches gloating after a win and dejected coaches trying to mitigate a loss. Our tour took us out through the stadium and down onto the field. Poljud stadium these days has a seating capacity of 35,000 seats and is one of the two largest stadiums in Croatia. 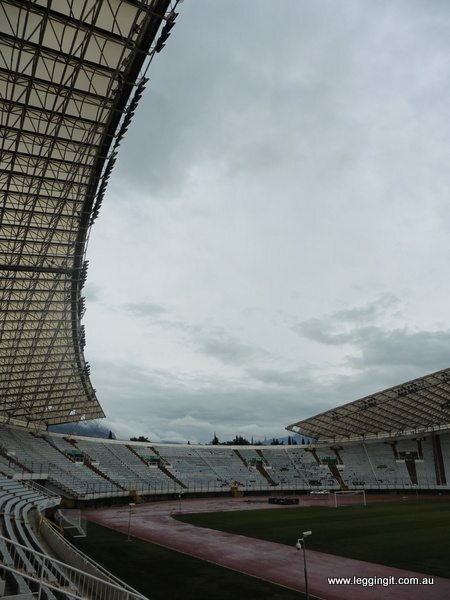 It was built for the 1979 Mediterranean Games but has also hosted the 1990 European Athletics Championships and the 2010 IAAF Continental Cup. When the stadium was built, the roof was a marvel of architecture as it didn’t use supporting beams. The stadium is still quite beautiful affectionately known to the locals as the “Poljud beauty”. The largest crowd recorded in the stadium was 52,000 people for a match against Hamburg SV in 1980. 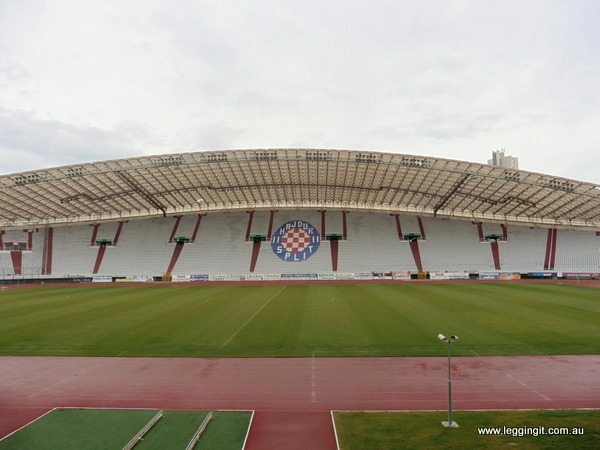 Up until 1979 Hajduk played in a stadium known as “Stari Plac” which is now used by Split rugby club. Frane pointed out his old home in a picture which overlooked the old stadium, maybe that’s where he developed a love of this club. It was also nice chatting with some of the other members of the tour to find out how they became supporters and what Hajduk means to them. The final part of our tour took us past the chapel. A strange addition in a stadium for us but maybe necessary for some players and coaches post game. 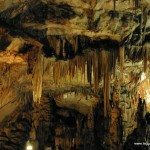 Overall it was a great tour with Frane, we learnt so much about Hajduk and the Torcina.We would highly recommend the tour for any sports fans and at 35 kuna for adults and 20 kuna for children the tour is a good value way to spend a few hours. Good luck to the club, Hajduk forever!